In 1998, twenty-nine Alice Love is married to the love of her life, Nick, expecting her first baby, and recently bought a dream house, which she and her husband plan on renovating. She loves her sister dearly, has a small circle of close friends, and lives life to the fullest everyday. Suddenly she wakes up at a gym (she hates the gym!) after an accident one Friday evening and is told that she is no longer 29, but 39, and has somehow misplaced an entire decade from her life. Alice is confounded by this new world that she encounters in 2008, especially since she discovers that she has not one kid, but three, has drifted apart from her sister, is now the social butterfly at her kids’ school, and is divorcing Nick, the so-called love of her life. Alice struggles to cope with all these drastic changes that the last 10 years have brought, as well as the onslaught of strange memories that keep drifting into her mind. Can Alice finally figure out what happened to her, to make her lose the one person who always thought would be by her side, before losing her mind? What first drew me to What Alice Forgot was its resemblance to Sophie Kinsella’s Remember Me?. I love stories about people forgetting and remembering. But Remember Me? lacked any real depth, especially towards the end of the story, and so I’d hoped that I would find some depth here. And boy did I ever! What Alice Forgot is funny, heart-warming, and touching. I read it nearly in a day; I just couldn’t put it down! Twenty-nine year old Alice is hilarious! Her reactions at everything in 2008 are just priceless. Her efforts to reconcile with her husband and reconnect with her sister are heart-warming, especially she can’t fathom what made them drift apart in the first place. She is a character that is so full of life and optimism, it’s no wonder that all the characters around her seem dumbfounded by her new/old personality. It’s clear that many people aren’t very fond of Alice right now, especially the way she’s treated them in recent years, but Alice doesn’t give up in trying to build bridges. What I loved about the story is that none of the characters were two-dimension. From Alice to Nick to their children to Alice’s mother and sister. Everyone was fighting their own battle that Alice (all consumed in her own world) knew nothing about. The characters were so well fleshed out that I felt like I knew them! A perfect example of this is Alice and Nick’s relationship. When she wakes up from her accident, Alice has no memory of the struggles and fights that her and Nick and gone through over the past 10 years. All she remembers are the rosy memories from 1998, and she is determined to get back together with Nick in order to return to that blissful time. But as soon as her memories return, her reasons for divorcing Nick come straight back to the surface and her rosy memories disappear. The ending demonstrated the fact that both Alice and Nick were dynamic, complex characters who had changed as a result of their relationship. While I loved the ending for throwing a whole new light on Alice, especially as her memories resurfaced, I didn’t like the way Moriarty choose to wrap things up. It ends rather abruptly, with an epilogue that takes place years later and then fills in the gaps. There are some poignant moments here that Alice thinks about in hindsight during that week she lost her memory, but I would have loved to have experienced those moments in real time. 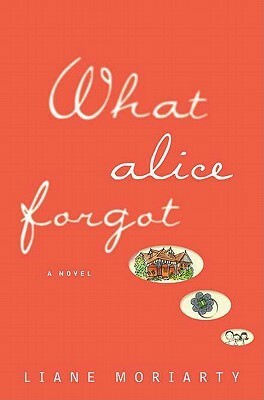 Tender, hilarious, and sweet, What Alice Forgot warmed my heart and made me smile. It reminded me of the way time is passing us by, with us so obsessed with creating memories that we don’t stop to enjoy the moment. This was a book club pick at work! The ladies in the book club loved it! I’ve been meaning to read it myself, but I haven’t yet! It sounds fabulous though! The synopsis totally reminded me of Kinsella too!